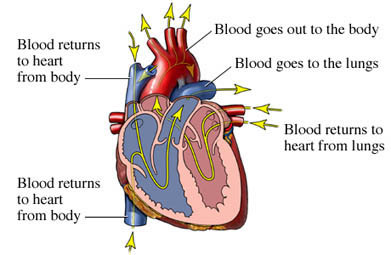 With heart failure, the heart is unable to pump the right amount of blood throughout the body. This causes blood to back up in the veins. Depending on which part of the heart is affected, this can lead to a buildup of excess fluid in the lungs, feet, and elsewhere. Heart failure can worsen with time, which may lead to the use of many treatments. Because of this, doctors are aggressive in treating heart failure to try to prevent it from worsening. Heart failure is more common in older adults, men, and people of African American descent. Heart failure may be caused by another condition. Treating this condition should improve your heart failure or prevent it from getting worse. If you smoke, talk to your doctor about ways to quit . Eat a healthful diet . Your diet should be low in fat and high in fiber . In some cases, you may need to restrict salt and fluid intake. Begin an exercise program with guidance from your doctor. Aerobic training may help improve your level of physical activity and quality of life. You should aim to exercise for 20-30 minutes at least 5 times each week. You can begin slowly and work your way to this goal. Talk to your doctor before you start an exercise program. Weigh yourself every morning. This will allow you to quickly detect if you are retaining fluid. Call your doctor if you gain three or more pounds in one day, five or more pounds in one week, or whatever amount you were told to report. The best time to weigh yourself is before breakfast and after urinating. You should weigh yourself while wearing the same type of clothes, without shoes, and on the same scale. This will help you to know that your weight is accurate. Your doctor may advise you to take supplements, such as coenzyme Q10. Follow your doctor's advice regarding taking any supplements. If heart failure worsens, you may need medical devices to help your heart pump blood properly. Note : Non-steroidal anti-inflammatory drugs such as ibuprofen and naproxen can worsen your condition. Talk to your doctor about other medications you may be able to take. Lose weight if needed. After you have lost weight, maintain a healthy weight . Eat whole grain breakfast cereal. In addition to the other healthy habits, this may reduce your risk. Congestive heart failure and congenital defects. American Heart Association website. Available at: http://www.heart.org/HEARTORG/Conditions/CongenitalHeartDefects/TheImpactofCongenitalHeartDefects/Congestive-Heart-Failure%5FUCM%5F307111%5FArticle.jsp#.Wbk5j7KGNQJ. Updated January 5, 2017. Accessed September 13, 2017. Explore heart failure. National Heart, Lung, and Blood Institute website. Available at: https://www.nhlbi.nih.gov/health/health-topics/topics/hf. Updated June 22, 2015. Accessed September 13, 2017. Heart failure with reduced ejection fraction. EBSCO DynaMed Plus website. Available at: http://www.dynamed.com/topics/dmp~AN~T114099/Heart-failure-with-reduced-ejection-fraction . Updated September 1, 2017. Accessed September 13, 2017. Lifestyle changes for heart failure. American Heart Association website. Available at: http://www.heart.org/HEARTORG/Conditions/HeartFailure/PreventionTreatmentofHeartFailure/Lifestyle-Changes-for-Heart-Failure%5FUCM%5F306341%5FArticle.jsp#.Wbk6sbKGNQJ. Updated May 9, 2017. Accessed September 13, 2017. Paterna S, Parrinello G, Cannizzaro S, et al. Medium term effects of different dosage of diuretic, sodium, and fluid administration on neurohormonal and clinical outcome in patients with recently compensated heart failure. Am J Cardiol. 2009;103(1):93-102. Physical changes to report. American Heart Association website. Available at:http://www.heart.org/HEARTORG/Conditions/HeartFailure/PreventionTreatmentofHeartFailure/Physical-Changes-to-Report%5FUCM%5F306356%5FArticle.jsp#.Wbk69LKGNQI. Updated May 9, 2017. Accessed September 13, 2017. Yancy CW, Jessup M, Bozkurt B, et al. 2013 ACCF/AHA guideline for the management of heart failure: a report of the American College of Cardiology Foundation/American Heart Association Task Force on Practice Guidelines. J Am Coll Cardiol. 2013;62(16):e147-e239. 4/16/2009 DynaMed Plus Systematic Literature Surveillance http://www.dynamed.com/topics/dmp~AN~T114099/Heart-failure-with-reduced-ejection-fraction : Nilsson BB, Westheim A, Risberg MA. Effects of group-based high-intensity aerobic interval training in patients with chronic heart failure. Am J Cardiol. 2008;102(10):1361-1365. 7/6/2009 DynaMed Plus Systematic Literature Surveillance http://www.dynamed.com/topics/dmp~AN~T170319/DASH-diet : Levitan EB, Wolk A, Mittleman MA. Consistency with the DASH diet and incidence of heart failure. Arch Intern Med. 2009;169:851-857. 8/31/2009 DynaMed Plus Systematic Literature Surveillance http://www.ebscohost.com/dynamed: Djoussé L, Driver JA, Gaziano JM. http://www.dynamed.com/topics/dmp~AN~T474271/Heart-failure-screening-and-prevention . JAMA. 2009;302(4):394-400. 11/25/2013 DynaMed Plus Systematic Literature Surveillance. http://www.dynamed.com/topics/dmp~AN~T566763/Heart-failure-alternative-treatments : Madmani ME, Yusuf Solaiman A, Tamr Agha K, et al. Coenzyme Q10 for heart failure. Cochrane Database Syst Rev. 2014;(6):CD008684. 4/2/2014 DynaMed Plus Systematic Literature Surveillance http://www.dynamed.com/topics/dmp~AN~T905359/Choosing-Wisely : Updated July 23, 2015. 1/18/2017 DynaMed Plus Systematic Literature Surveillance http://www.dynamed.com/topics/dmp~AN~T113766/Coronary-artery-disease-possible-risk-factors : Emdin CA, Odutayo A, Wong CX, Tran J, Hsiao AJ, Hunn BH. Meta-analysis of anxiety as a risk factor for cardiovascular disease. Am J Cardiol. 2016;118(4):511-519.